I've finally found some time for crafting! Work has been pretty full on lately but I've treated myself to a week's holiday and boy am I enjoying myself: late nights, long lie ins and lunches out with family and friends. 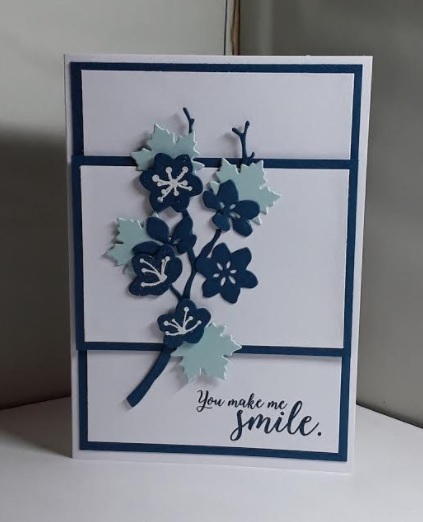 For this card I used my colourful Seasons Bundle which includes the Colourful Seasons stamp set and the Seasonal Layers Thinlits. My flowers were die cut from Dapper Denim card stock and three of them were stamped with the stamens and heat set with white embossing powder. The leaves are die cut from Soft Sky card stock and the branch and background mats are again Dapper Denim. Thanks for stopping by today - all products used on today's project are available in the current Stampin' Up catalogue. Please contact me for details on ordering or pop over to my on line shop HERE. Beautiful! Thank you for joining us at Make My Monday. Sian.